On the evening of April 15, a number of listed companies in the Shanghai and Shenzhen stock exchanges issued announcements. The following is a summary of important announcements. The savory food (603517) disclosed the annual report on the evening of April 15. The company achieved operating income of 4.368 billion yuan in 2018, a year-on-year increase of 13.45%; net profit of 641 million yuan, an increase of 27.69%. Earnings per share of 1.56 yuan. The company plans to increase 4 shares for every 10 shares and distribute 6.1 yuan. Guodian Power (600795) disclosed its annual report on the evening of April 15. The company achieved operating income of 65.49 billion yuan in 2018, a year-on-year increase of 9.45%; net profit of 1.2 billion yuan, down 41.86%. Earnings per share of 0.06 yuan. The company plans to find a gold dividend of 0.4 yuan for every 10 shares. Yunmei Energy (600792) disclosed its annual report on the evening of April 15. The company achieved operating income of 5.399 billion yuan in 2018, a year-on-year increase of 22.07%; net profit of 192 million yuan, turning losses into profits. The company had a loss of 486.387 million yuan in the same period last year. Sanfeng Intelligent (300276) released its annual report on the evening of April 15. The revenue in 2018 was 1.792 billion yuan, up 187% year-on-year; the net profit was 235 million yuan, up 264% year-on-year. The company plans to increase 4 shares for every 10 shares and distribute 1.50 yuan. Guiyangbank(601997) The annual report was disclosed on the evening of April 15. The company achieved operating income of 12.645 billion yuan in 2018, a year-on-year increase of 1.35%; net profit was 5.137 billion yuan, an increase of 13.39%. Earnings per share of 2.23 yuan. The company plans to increase 4 shares for every 10 shares and send 4 yuan. ST Energy Saving (000820) released the performance report on the evening of April 15. The revenue in 2018 was 54.28 million yuan, down 95.88% year-on-year; the net profit loss was 695 million yuan, which turned from profit to loss. 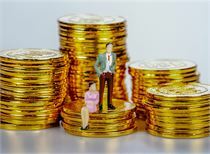 It is estimated that the loss in the first quarter of 2019 will be 35.72 million yuan - 45.22 million yuan, a loss of 66.73 million yuan in the same period of last year. Sinor (002485) released its annual report on the evening of April 15. The revenue in 2018 was 1.72 billion yuan, a year-on-year increase of 122%; the net profit was 129 million yuan, a year-on-year increase of 120%. The company plans to distribute 0.23 yuan for every 10 shares. At the same time, the company disclosed a quarterly report. 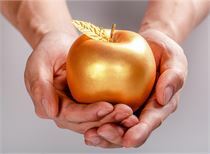 In the first quarter of 2019, the revenue was 846 million yuan, a year-on-year increase of 424.5%, and the net profit was 1.88 million yuan, a year-on-year loss. Poly Real Estate (600048) disclosed its annual report on the evening of April 15. The company achieved operating income of 194.514 billion yuan in 2018, a year-on-year increase of 32.66%; net profit of 18.904 billion yuan, an increase of 20.92%. Earnings per share of 1.59 yuan. The company plans to find a bonus of 5 yuan for every 10 shares. Ankai Bus (000868) released its annual report on the evening of April 15. The net profit loss in 2018 was 893 million yuan, a loss of 230 million yuan in the same period last year. Pengyi (300375) released its annual report on the evening of April 15. The revenue in 2018 was 1.458 billion yuan, a year-on-year increase of 27.6%; the net profit was 118 million yuan, a slight decrease of 0.79%. The company plans to increase 7 shares for every 10 shares and distribute 0.667 yuan. Aerospace Communications (600677) disclosed its annual report on the evening of April 15. The company achieved operating income of 12.506 billion yuan in 2018, an increase of 22.66% year-on-year; net profit of 210 million yuan, an increase of 109.27%. Earnings per share was 0.40 yuan. The company plans to distribute a cash dividend of 1.2 yuan for every 10 shares. Haida Group (002311) released its annual report on the evening of April 15. The revenue in 2018 was 42.157 billion yuan, a year-on-year increase of 29.49%; the net profit was 1.437 billion yuan, a year-on-year increase of 19%. The company plans to distribute 3 yuan (including tax) for every 10 shares. Boshen Tools (002282) released its annual report on the evening of April 15. The revenue in 2018 was 1.054 billion yuan, up 78% year-on-year; the net profit was 86.17 million yuan, up 68.7% year-on-year. The company plans to distribute 0.3 yuan for every 10 shares. At the same time, the company also disclosed a quarterly report. The net profit for the first quarter of 2019 was 17.56 million yuan, a year-on-year increase of 17%. ST Zhongji (000972) released a performance report on the evening of April 15. The revenue in 2018 was 627 million yuan, a year-on-year increase of 21%; the net profit was a loss of 430 million yuan, and the profit for the same period last year was 26.58 million yuan. Tianfeng Securities (601162) disclosed its annual report on the evening of April 15. The company achieved operating income of 3.277 billion yuan in 2018, an increase of 9.75% year-on-year; net profit was 303 million yuan, down 26.16% year-on-year. Earnings per share of 0.06 yuan. The company plans to send a cash dividend of 0.07 yuan for every 10 shares. International Industry (000159) released its annual report on the evening of April 15. The revenue in 2018 was 550 million yuan, a year-on-year increase of 55%; the net profit was 59.92 million yuan, a year-on-year loss. After deducting the net profit, the loss was 24.74 million yuan. In the same period of last year, the net profit loss was 93.51 million yuan. The company plans to distribute 0.3 yuan for every 10 shares. The company also disclosed the first quarter, the net profit for the first quarter of 2019 was 23.75 million yuan, a year-on-year loss. Kangda New Materials (002669) released its annual report on the evening of April 15. The revenue in 2018 was 928 million yuan, up 68.85% year-on-year; the net profit was 80.44 million yuan, up 83.75% year-on-year. The company plans to distribute 0.77 yuan for every 10 shares. Lixun Precision (002475) released its annual report on the evening of April 15. The revenue in 2018 was 35.85 billion yuan, a year-on-year increase of 57%; the net profit was 2.723 billion yuan, a year-on-year increase of 61%. The company plans to increase 3 shares for every 10 shares and distribute 0.50 yuan. China Recapital (600217) disclosed its annual report on the evening of April 15. The company achieved operating income of 3.136 billion yuan in 2018, a year-on-year increase of 14.61%; net profit of 316 million yuan, an increase of 31.58%. Earnings per share was 0.23 yuan. Shanxi Coking (600740) disclosed its annual report on the evening of April 15. The company achieved operating income of 7.229 billion yuan in 2018, a year-on-year increase of 20.58%; net profit of 1.533 billion yuan, an increase of 1567.38%. Earnings per share of 1.21 yuan. The company plans to distribute a cash dividend of 2 yuan for every 10 shares. Chuanhua Zhilian (002010) released its annual report on the evening of April 15. The revenue in 2018 was 20.148 billion yuan, a year-on-year increase of 4.85%; the net profit was 819 million yuan, a year-on-year increase of 74%. The company plans to pay 1 yuan for every 10 shares. Renrenle (002336) released its annual report on the evening of April 15. The revenue in 2018 was 8.13 billion yuan, down 8% year-on-year; the net profit loss was 355 million yuan, a loss of 538 million yuan in the same period last year. The company plans to increase 1 share for every 10 shares. Yongxing Special Steel (002756) released its annual report on the evening of April 15. The revenue in 2018 was 4.794 billion yuan, up 18.93% year-on-year; the net profit was 387 million yuan, up 10% year-on-year. The company plans to distribute 10 yuan for every 10 shares. Yongxing Special Steel also disclosed a quarterly report on the same day. In the first quarter of 2019, it achieved a net profit of 101 million yuan, a year-on-year increase of 10.61%. NavInfo (002405) released its annual report on the evening of April 15. The net profit in 2018 was 479 million yuan, an increase of 80.65%. The company plans to increase 5 shares for every 10 shares and distribute 0.14 yuan. At the same time, the company disclosed a quarterly report. In the first quarter of 2019, the company achieved a net profit of 42.23 million yuan, a year-on-year decrease of 42.68%. Dawson AG (603800) disclosed its annual report on the evening of April 15. The company achieved operating income of 1.169 billion yuan in 2018, a year-on-year increase of 40.80%; net profit of 890.68 million yuan, an increase of 204.67%. Earnings per share was 0.43 yuan. The company plans to find a bonus of 5 yuan for every 10 shares. Yi Hualu (300212) released its annual report on the evening of April 15. The revenue in 2018 was 2.956 billion yuan, down 1.74% year-on-year; the net profit was 302 million yuan, up 50% year-on-year. The company plans to increase 2 shares for every 10 shares and distribute 1.60 yuan. Jiayou International (603871) disclosed its annual report on the evening of April 15. The company achieved operating income of 4.101 billion yuan in 2018, a year-on-year increase of 26.40%; net profit of 270 million yuan, an increase of 30.94%. Earnings per share was 2.49 yuan. The company plans to increase 4 shares for every 10 shares and distribute 5 yuan. Huichuan Technology (300124) released its annual report on the evening of April 15. The revenue in 2018 was 5.874 billion yuan, a year-on-year increase of 23%; the net profit was 1.167 billion yuan, a year-on-year increase of 10%. The company plans to distribute 2 yuan for every 10 shares. Zhaofeng shares (300695) disclosed the annual report on the evening of April 15. The company achieved operating income of 497 million yuan in 2018, down 18.26% year-on-year; net profit was 196 million yuan, down 4.41% year-on-year. Earnings per share of 2.94 yuan. The company plans to find a gold dividend of 10 yuan for every 10 shares. San Mao Pai Shen (000779) disclosed a quarterly report on the evening of April 15. The company's first quarter revenue was 475 million yuan, up 19.4% year-on-year; net profit was 55.28 million yuan, up 46% year-on-year. China Nuclear Titanium (002145) released a quarterly report on the evening of April 15. The first quarter achieved revenue of 818 million yuan, a year-on-year increase of 6.29%; net profit was 108 million yuan, an increase of 42.81%. Beilu Pharmaceutical (300016) disclosed a quarterly report on the evening of April 15. The company achieved revenue of RMB 172 million in the first quarter, a year-on-year increase of 42%; net profit was RMB 40.57 million, a year-on-year increase of 41%. Dahua Intelligent (002512) released its forecast for the evening of April 15th. It expects a net profit loss of 30 million yuan to 50 million yuan in the first quarter and a loss of 776.999 million yuan in the same period of last year. China Metallurgical(601618) Announced on the evening of April 15, the company's new contract value in January-March 2019 was 182.12 billion yuan, an increase of 5.3% over the same period of the previous year, of which the newly signed overseas contract amount was 7.07 billion yuan. Zhongchao Holdings (002471) announced on the evening of April 15. Recently, State Grid Corporation and other companies issued the announcement of the successful bidding results. The company and its wholly-owned subsidiary, Mingzhu Cable and Yuanfang Cable, were the winning bidders. The winning bid amounted to 430 million yuan, accounting for the company. The total audited operating income of 2018 is 5.64%. International Industry (000159) announced on the evening of April 15 that within six months after 15 trading days of the company's controlling shareholder Gan Taizhong, the reduction of the holdings did not exceed 19.22 million shares, accounting for 4% of the company's total share capital. Hengtong (603223) announced on the evening of April 15 that shareholders holding 7.70% of the shares planned to reduce their holdings by no more than 7,763,400 shares in the next six months, accounting for 3.85% of the company's total shares. Xinyuan Technology (300472) announced on the evening of April 15 that within 6 months after 15 trading days of the 7.71% shareholder ABC International, the shareholding will not exceed 6.63 million shares, accounting for 5% of the company's total share capital. Xuan Ya International (300612) announced on the evening of April 15 that the company's actual controller and chairman, Zhang Xiubing, plans to reduce its holdings by no more than 410,000 shares in a centralized bidding manner within 6 months after 15 trading days, accounting for 0.25% of the company's total share capital. .
Kantley (603987) announced on the evening of April 15 that the shareholder of Hongsheng Boxin, which holds 6.43% of the shares, plans to reduce its holdings by no more than 28,790,700 shares, which is no more than 6.43% of the company's total share capital. Lanhai Huateng (300484) announced on the evening of April 15 that Wang Hongmei, a shareholder holding 7.75%, plans to reduce its holdings by no more than 12.48 million shares in the next six months, accounting for 6% of the company's total share capital. Jinfu Technology (300128) announced on the evening of April 15 that Ruimu Investment, a 9.59%-owned shareholder, plans to reduce its holdings by no more than 21.88 million shares within 6 months after 15 trading days, ie not exceeding 2% of the company's total share capital. .
Jiuhou Hi-Tech (300631) announced on the evening of April 15 that shareholders will reduce their holdings by no more than 5.76 million shares within 6 months after 3 trading days, ie not exceeding 5.4569% of the company's total share capital; in addition, shareholder Wisdom Jielang and its concerted actions, Jieyi Venture Capital and Weisi Investment Fitting, will not exceed 57.8 million shares, that is, no more than 5.48% of the company's total share capital; Director Liu Fei,ExecutiveWang Xiaohu, Pan Shouliang, Jin Xinlei, Yang Jiheng and Wei Wei reduced their holdings by 545,000 shares, accounting for 0.5163% of the company's total share capital. Tianyu Information (300205) announced on the evening of April 15 that Huagong Ventures, the controlling shareholder of the company, reduced its holdings by 5.37 million shares on April 12 and April 15 by way of centralized bidding, accounting for 1.25% of the company's total share capital. Note: The company has previously disclosed that Huagong Venture Capital plans to reduce its holdings by no more than 21 million shares from April 10 to October 9, accounting for 4.88% of the company's total share capital. Zhongxin Sike (002912) announced on the evening of April 15 that shareholders holding 6.41% of the shares of Inuit plans to reduce their holdings by no more than 2.74 million shares within 6 months after 15 trading days, accounting for 2.56% of the company's total share capital. Shilong Industrial (002748) announced on the evening of April 15 that the 6.67% shareholder of Leping City Longqiang Investment Center (Limited Partnership) plans to reduce its holdings by no more than 4 million shares within 90 days after 15 trading days. The total share capital is 1.67%. Jing Jiawei: The actual controller and some senior executives will not exceed 4.63% of the shares. Jingjiawei (300474) announced on the evening of April 15 that the controlling shareholder and real controller of the company, Yu Lili and Zeng Wanhui, intend to reduce their holdings by no more than 9 million shares in the next six months, accounting for 2.986% of the company's total share capital. In addition, Director Rao Xianhong, Deputy General Manager Hu Yahua, Executive Deputy General Manager Yu Shengfa, Supervisor Chen Nuxing, and Secretary of the Board Liao Kai intend to reduce their holdings of not more than 0.5541%, 0.5541%, 0.277%, 0.2493% and 0.0050% respectively. More like (002761) announced on the evening of the 15th, the company intends to place all assets and liabilities into its wholly-owned subsidiaries. After Zhejian Group became a shareholder of the company, the company replaced the transaction-valued portion of the assets it owns with the assets owned by the state-owned operating company. At the same time, the company purchased the shares from the counterparty in a non-public offering. The inflow of assets exceeds the difference in the pricing of the disposed assets, and the Zhejiang Construction Group is absorbed and merged. The transaction constitutesReorganizationListing. Note: Before the transaction, Zhejiang Construction Group intends to acquire 29.83% of the shares held by Chen Jun and Huang Yani. The stock will resume trading on the 16th. Sumita (600710), which has been trading for three consecutive days, announced on the evening of April 15 that Sumerda Group had made a commitment during the major asset restructuring: Sumeda Group will complete the national financial system within 36 months after November 14, 2016. 5.45% equity and SINOMACH 2.11%Equity transferThe procedures for the transfer of equity to third parties; the company responded with the following concerns about the recent investment in the market, and the company responded with no recent asset injection plan. Currently, the company is looking for a suitable equity transferee to solve the cross-shareholding problem. The transferee has not yet confirmed. Dongfeng Technology (600081), which has been trading for four consecutive trading days, announced on the evening of April 15 that the company's production and operation are normal, and there is no significant information that should be disclosed but not disclosed. On April 2, Dongfeng Company, the People's Government of Fuyang City, Hubei Province, and Huawei signed the Strategic Cooperation Framework Agreement for the “Zhihang Longzhong” project. As a subsidiary of Dongfeng Company, the company is currently not involved in the “Zhihang Longzhong” project. In addition to this news, the company has not found other media reports or market rumors that may have a significant impact on the stock price. Liyuan Refining (002501) announced on the evening of April 15 that the company's board of directors received a notice from the company's controlling shareholder and real controller Wang Min's family on April 15. Wang Min died of illness on April 14. Wang Min directly holds 14.48% of the company's shares, and his spouse Zhang Yongxia and the eldest son Wang Jianxin jointly control the company. After Wang Min’s death, the company’s actual controller will change. The death of Wang Min did not have a material adverse impact on the company's various operations and management activities. 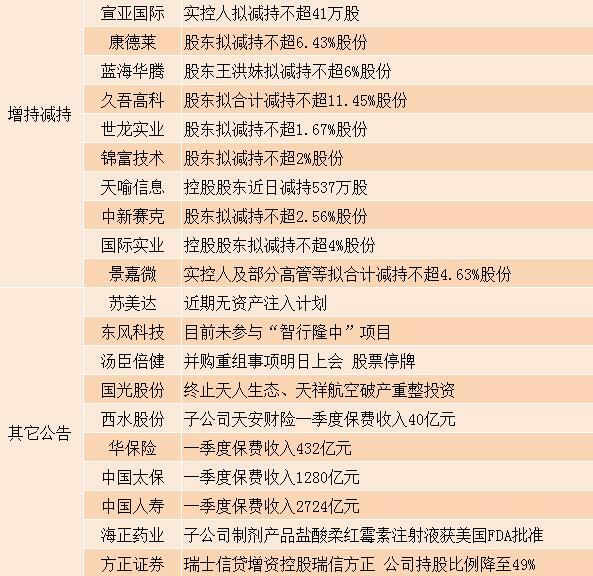 China Life Insurance(601628) Announced on the evening of April 15th, the company accumulates the original period from January 1, 2019 to March 31, 2019.InsuranceThe premium income is about 272.4 billion yuan. Tomson Bianjian (300146) announced on the evening of April 15 that the CSRC listed companyMergers and acquisitionsThe audit committee will hold a working meeting on the morning of April 16 to review the company's issue of shares to purchase assets. The company's stock will be suspended from April 16. China Pacific Insurance(601601) Announcement on the evening of April 15th, subsidiaryThe Pacific OceanLife Insurance and Pacific Property Insurance's accumulated insurance business income from January 1, 2019 to March 31, 2019 was 92.852 billion yuan and 35.148 billion yuan, respectively, totaling 128 billion yuan. Guoguang Co., Ltd. (002749) announced on the evening of April 15 that the company was previously identified as Tianren Ecology and Tianxiang Airlines' substantial merger and bankruptcy reorganization investors. As of April 12, the "Restructuring Plan Draft" has not been approved and has not been approved by the Ji'an Intermediate People's Court. The company decided to terminate the investment and delivered the “End of Bankruptcy and Reorganization Investment Letter” to Tianren Ecological Manager, Tianxiang Aviation Manager and Ji’an Intermediate People’s Court on April 12, requiring the administrator to receive “End of Bankruptcy”. The company will refund the 20 million yuan deposit paid by the company to the company's account within 5 days of the entire investment letter. Xinhua Insurance(601336) Announced on the evening of April 15, the company's accumulated insurance premium income from January 1, 2019 to March 31, 2019 was 43.169 billion yuan. Xingmin Zhitong (002355) announced on the evening of April 15 that the company's subsidiary Intermec and Beijing Yunhai Internet Technology Co., Ltd. (Yunhai Internet) signed the "Strategic Cooperation Agreement", the two sides intend to establish a long-term strategic partnership, intended With the help of the national strategy, the intelligent networked automobile industry policy is favorable, and the deep cooperation of mutual benefit and win-win is launched. Haima Automobile (000572) announced on the evening of April 15. On April 15, the company's wholly-owned subsidiary Haima Automobile Co., Ltd. and Beijing Jingdong Century Trading Co., Ltd. (Jingdong) signed the Strategic Cooperation Framework Agreement in Zhengzhou. The two sides will take the hippocampus 8S and VF00 models as the entry point and continue to cooperate in the fields of customized models, technical research, business exploration and marketing matrix. Xishui Co., Ltd. (600291) announced on the evening of April 15 that the subsidiary Tianan Property Insurance Co., Ltd. accumulated the original insurance premium income from January 1 to March 31, 2019 to RMB 4,020 million. Haizheng Pharmaceutical (600267) announced on the evening of April 15 that the holding subsidiary Haizheng Hangzhou Company applied for a new drug for daunorubicin hydrochloride injection to the US FDA (ANDA, the US generic drug application, applied for US FDA). The approval of the review means that the applicant can produce and sell the product in the US market) has been approved. Yueyang Lin Paper (600963) announced on the evening of April 15 that the company and the Institute of Materia Medica of the Chinese Academy of Agricultural Sciences signed the "Technical Service Contract" on April 15, 2019. The company will entrust the Institute of Materia Medica of the Chinese Academy of Agricultural Sciences to produce hemp for one year. The crops (industrial cannabis and kenaf with THC content less than 0.3%) carry out professional technical guidance and special technical services for large-scale and high-efficiency planting. Zhonggang Tianyuan: It is planned to invest in “hydrogen fuel cell graphite bipolar plate material” project with related parties. Sinosteel Tianyuan (002057) announced on the evening of April 15 that the Nanjing Research Institute, a wholly-owned subsidiary of the company, signed a cooperation agreement with Sinosteel for the project of “hydrogen fuel cell graphite bipolar plate material”, stipulated “hydrogen fuel cell graphite”. Bipolar plate material" product technology development, industrial product design, industrial application demonstration project establishment, related marketResearchCooperate with the development and production, sales and technical services of related products in the development and establishment of industrialized operating entities. Founder Securities (601901) announced on the evening of April 15 that Credit Suisse unilaterally increased its capital to Credit Suisse Founder in a non-public agreement. After the completion of the capital increase, Credit Suisse’s shareholding in Credit Suisse Founder increased from 33.30% before the capital increase to 51. %, and became the controlling shareholder of Credit Suisse Founder; Founder Securities gave up this capital increase, and the shareholding ratio of Credit Suisse Founder was reduced from 66.70% before the capital increase to 49%. Credit Suisse Founder is no longer included in the scope of the company's consolidated statements.